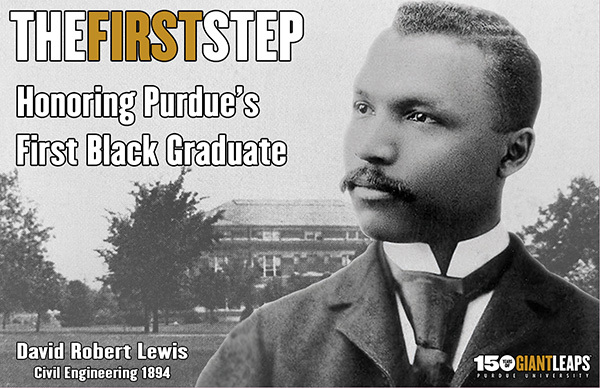 The Lyles School of Civil Engineering and the College of Engineering hosted a special event on Tuesday, February 26th to celebrate the legacy and significance of David Robert Lewis (BSCE 1894), Purdue University's first black graduate. The Lyles School of Civil Engineering and the College of Engineering hosted a special event on Tuesday, February 26th to celebrate the legacy and significance of David Robert Lewis (BSCE 1894), Purdue University's first black graduate. The event included a lecture by Dr. Mamon Powers, Jr. as well as a luncheon showcasing the historical perspective of African Americans in engineering at Purdue and the rededication of the National Society of Black Engineers Key. Keynote Lecture: Dr. Mamon Powers, Jr. (BSCE '70 and HDR '14) - "The Path is the Same, but the Journey is Different"
Dr. Powers' lecture provided the basis for a Purdue Exponent article - "Purdue grad discusses changing black experiences on campus"
The luncheon included a special feature showcasing the historical perspective of African Americans in engineering at Purdue and the re-dedication of the National Society of Black Engineers Key.